What we in North America consider a ‘traditional’ funeral, is in actual fact a fairly recent phenomenon. In most of the world, including much of continental Europe, what we call an Alternative Funeral is the traditional funeral, embalming is not carried out and families and friends care for their deceased and pay their last respects at a home wake. We are experiencing a growing interest in returning to this more simple, spiritual, family-focused practice. 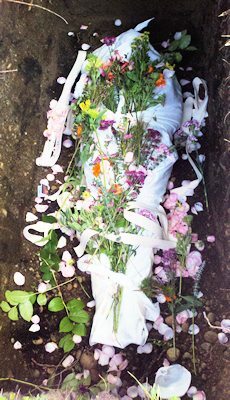 Green fu nerals and burials are also a growing trend as society becomes more mindful of our carbon footprint and the impact we have on the planet. 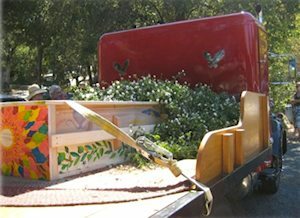 A "Green" or alternative funeral and burial is an environmentally conscious approach to the final arrangements and disposal of the body in keeping with the deceased’s personal values. The body is not embalmed with toxic chemicals, which usually contain formaldehyde – known to cause health risks to those working in the funeral industry. Only biodegradable funerary products are used. Burial occurs without a cement burial vault or the use of metal or non- sustainable hardwood caskets. Often, families choose to use a shroud, make a casket, or purchase a cardboard casket, which they can decorate as a loving and meaningful tribute to the deceased. I offer care, support and guidance before, during and after the death of a loved one and in my role as a certified celebrant, I can also officiate at funeral and burial proceedings. I would consider it an honour to meet with you to discuss how I can guide and support you through the process of a family-directed home funeral and Green burial. Caring for a loved one at home after death is legal in Ontario. Families are perfectly within their rights to have the body of a loved one lie at home until burial or cremation. Embalming is not essential, nor required by law, and has a negative environmental impact. Dry ice is an inexpensive and easily accessible alternative which can be used to keep the body cool at home. The average cost of conventional funeral care in Canada (including casket and taxes; excluding burial or cremation costs) is approximately $6500 while a home directed, alternative funeral costs approximately $1000 - $1500. In Ontario, a family member can make all arrangements and decisions regarding the after-death care of their loved one, including completing and filing necessary documents and transportation of the deceased (in any vehicle) to a home, place of ceremony, crematorium, or cemetery. Traditional caskets/coffins are not required by law for burial. A family can choose to do all, or just part of the after-death care. For example, you may wish to care for your loved one’s body at home, but hire the services of a funeral home to provide transportation of the body to the church, cemetery, or crematorium. Family led funerals focus on participation and choice. The family decides how the event unfolds so that it addresses their needs and helps them come to terms with the loss of their loved one. A family directed funeral is slow and focused rather than a cookie-cutter event hosted by a funeral corporation. This end of living care movement includes death becoming de-medicalized and will again be viewed as a natural event that can be managed in natural settings such as a home. This also includes families directing some or all of the funeral and after death care arrangements. From washing and anointing the body, to dressing the body and holding vigils (sitting with a loved one for up to three days), to transporting the body to a cemetery or crematorium, a family member or legally designated agent can carry out any or all of these tasks. I would be pleased to provide consultation services for after-death home care and vigil and disposition choices for those who wish to learn more about natural death care options, including green burial. There are no standard guidelines for home funerals. It may simply comprise a few friends and family members supporting one another in a vigil, or it could be a multi-generational gathering of extended family and friends, preparing and caring for the body of their loved one at home, in preparation for transportation to the church, cemetery or crematorium. I felt like you were a calm presence in the chaos, 100% there for us. It was a deeply moving experience to be able to care for Jody after her death. Your guidance and support opened a heart-focused space for this most difficult but yet beautiful experience. Our family, friends and I felt the unexpected gifts and this experience brought us together in grief, mourning and celebration of our dear Jody. Why Consider After Death Care & Home Funeral? It allows family and friends to be in control of the process of saying goodbye to a loved one. It creates an opportunity for a more expressive closure which may nurture healing in the grief process. You may find it comforting to know that the care and preparation of your loved one’s body is being carried out by family and friends instead of strangers. By participating in the vigil process, family and friends can give and receive emotional support from each other. We often feel helpless during this difficult time. Participating in the after death care and home funeral process, allows us to feel useful and is seen as a final act of our love for the deceased. A Funeral Celebrant's mission is to create a ceremony that reflects the wishes, beliefs, cultural backgrounds and values—religious and non-religious—of your loved one and your family. 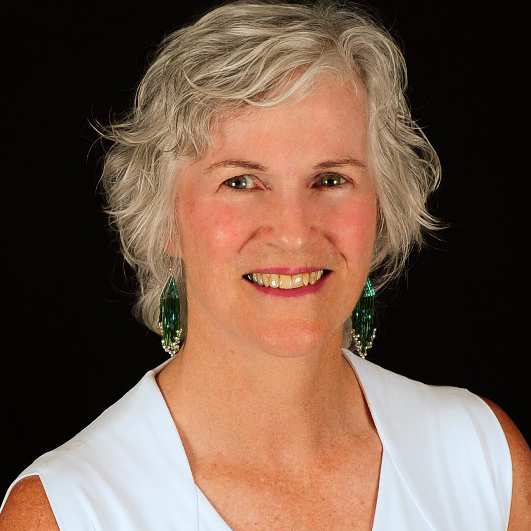 My wish as a Certified Life-Cycle Celebrant® is to demonstrate to people how to genuinely re-connect with themselves and each other through the revived ancient traditions of ceremony, ritual and oral story-telling. 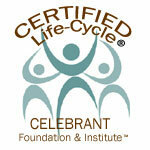 As a Certified Life-Cycle Celebrant® I will spend quality time creating a ceremony and learning about your loved one through meetings and interviews with family members and friends. Interviews that are sensitive and aware of the different personalities of those individuals, their grieving needs and how the individual family members express themselves. In collaboration with you we will carefully craft a eulogy and create a ceremony with music, quotes, readings, unique symbols and rituals. You are given complete choice to the final approval over the ceremony/eulogy. It would truly be my privilege to provide you with the finest in meaningful and personalized funeral ceremonies that pay tribute to and honour the life of those you love.